The imaging application SAOImage ds9 is distributed with CIAO as the default imager. It is developed independently from CIAO but does contain some CIAO-specific features. To introduce a few of the key features used in CIAO analysis ranging from simple (e.g. defining preferences) to complex (e.g. use of the XPA messaging system). Last Update: 1 Feb 2016 - Updated ds9 links. The CXC has prepared several video demos and tutorials that complements the material presented below. A short list of the available command line arguments can be found by typing "ds9 --help" in a term window. Detailed descriptions of the arguments are available from the Command Line Options section of the ds9 manual. Most of the options are self-explanatory, but there is more information on each in the Preferences section of the ds9 manual. Note that under the "Information Panel" is an option to display "Detector" coordinates. This does not refer to the Chandra detector coordinates (i.e. det or tdet). If these settings are changed the preferences are written to $HOME/.ds9.prf. The next time ds9 is started, this file is	read and the preferences are used. Important: as mentioned before, the preference files are generally not backward-compatible. This means a .ds9.prf created by a newer version of ds9 may react badly with the ds9 packaged in CIAO. Please reference the Preferences section of the ds9 manual for information on avoiding this problem when supporting multiple versions of ds9. The imager will display a 1k x 1k array of pixels by default (this may be changed in the preferences). The typical Chandra image will need to be binned to see the entire field of view. Using the "Bin" button or menu, try a binning factor of 16. If the Scale is also set to "Log", the image should look like Figure 1. Change the binning factor of an image by using the "Bin" button or the "Bin" menu. ds9 also has the ability to display any of the other columns stored in the event file, although it is only meaningful to use one of the spatial vector columns. In order to display the file in other coordinates, use the "Bin → Binning Parameters" menu to select the two columns to display. 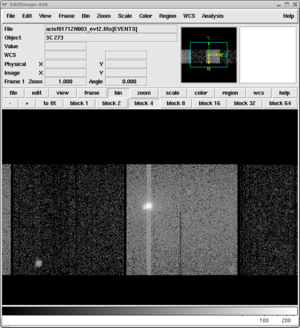 To create an image in detector coordinates (detx,dety), select them from the "Bin Columns" menus. Change "Block" to 4, select the "or center of data" button, and click "Apply". Figure 2 shows the results. The columns to bin are selected in the "Bin Parameters" section of the "Bin" menu. This coordinate system is unaffected by the dither, so point sources appear as limb-brightened squares. 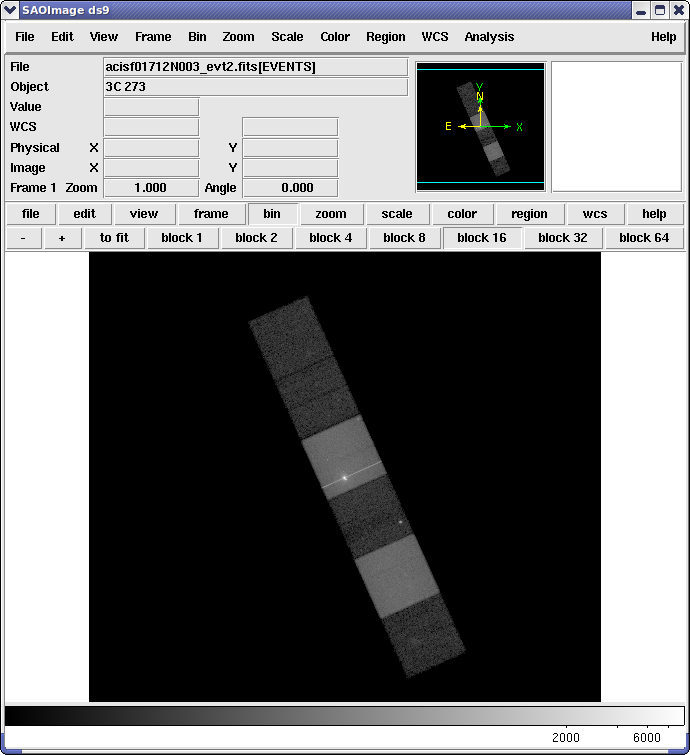 Displaying the event file in detector coordinates reveals details about how the observation was done. 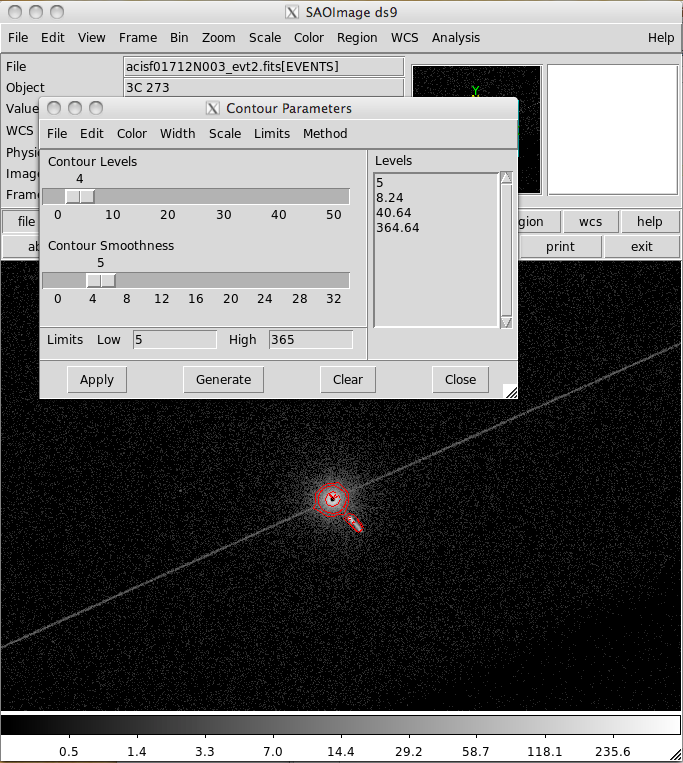 Bad columns (removed in the level=2 event file, so not visible here) are displayed as dark lines and point sources appear as limb-brightened squares due to the telescope dither. The file is loaded into ds9 and displayed in detector coordinates. ds9 allows the simultaneous viewing of multiple images through the use of frames, which are memory areas used to store images for viewing. Notice that the pathnames may be relative or absolute. Issuing this command created Figure 3. The images are displayed in the order in which they were loaded, starting at the upper-right corner. The fourth space in this layout (lower-right) is empty. Use the "Frame → New Frame" menu option. This process can be repeated to create as many frames as desired. To load the data, select the desired frame and then choose the file from the "File → Open..." dialog box. Displaying multiple images can be helpful when trying to compare them. Images may be displayed side-by-side using the "Tile Frames" option or sequentially using the "Blink Frames" option, both found in the "Frame" menu. If the WCS info is defined for each system (or if they have the same image pixel scale), use "Frame → Match Frames" to align them for comparison. To apply contours to the data, open the "Contour Parameters" window from "Analysis → Contours Parameters". There are four parameters to adjust: the number of contours ("Contour Levels"), the smoothness of the contours, the flux at the lowest contour, and the flux at the highest contour. The flux at each contour is displayed in the "Levels" portion of the window. Be sure to click "Generate" whenever an adjustment is made to the contour parameters; this will recalculate the levels to be applied to the image. In this example, four levels were created for the flux limits 5 to 365 at a smoothness of 5. Figure 4 shows the "Contour Parameters" window and the resulting contours on the image. Smoothing the contours can make the number of contours displayed less than the number generated. Apply contours to data via the "Contour Parameters" window from the menu "Analysis → Contours Parameters." It is also possible to access Digital Sky Survey (DSS) optical images matching your observation via the "Analysis → Image Servers" menu in ds9. There are several DSS server options; we used "SAO-DSS". The "SAO-DSS Server" window allows you to retrieve an optical image of the field of your observation and load it into a new frame. The default retrieval image size and (RA,Dec) is equal to the size and center of the field currently displayed. You may also want to use the menus in the dialog box to select a different server for quicker access from your location. In this example, none of the values determined by ds9 were changed before clicking on "Retrieve". Select the frame with the X-ray data in it. Use "Frame → Match Frames → WCS" to align the two images. To copy the contours, open the "Contour Parameters" dialog again and select "Copy Contours" from the "File" menu. Leave the window open, as it is needed in a future step. 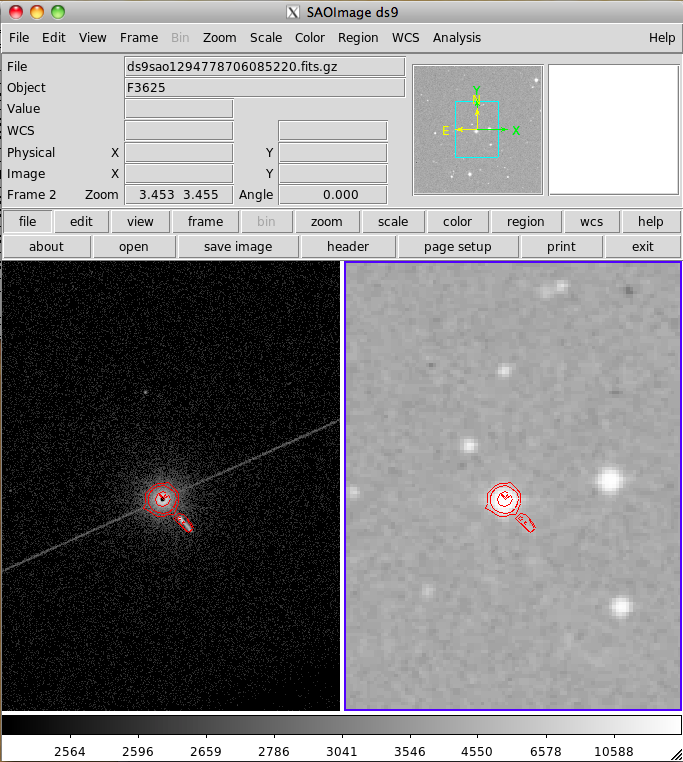 Select the frame with the optical data in it. 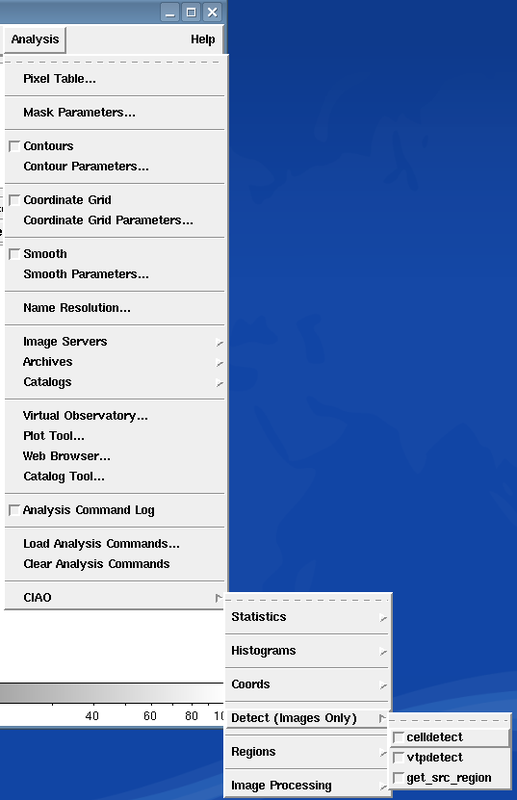 Using the "File" menu of the "Contour Parameters" dialog, select "Paste Contours". Adjust the parameters in the "Contours Parameters" dialog box that pops up, if desired, then click "OK". In this example, the contour color was changed from green to red. The final product should look similar to Figure 5. Adjust the contrast and the jet is identifiable in both the xray and optical image, extending a few arcseconds to the southwest (lower right). Access Digital Sky Survey (DSS) optical images matching your observation via the "Analysis → Image Servers" menu. The contours can also be saved to disk by choosing "Save Contours" from the "File" menu. They can then be loaded back into ds9 with the "Load Contours" option. This image is used as the starting point for the next example (Locking Crosshairs), so do not exit ds9 if you are planning on continuing in the thread. Having WCS defined for two images can be valuable in their simlutaneous analysis, as shown in the previous section where the images were matched via WCS. This information, combined with the "locking crosshairs" feature in ds9, can be used to examine the same region in several frames simultaneously. Starting from the previous example, change the cursor to crosshair by means of the "Edit" menu. To lock the crosshairs into the same coordinate system for correlating features between the two images, go to "Frame → Lock Crosshairs → WCS". After locking crosshairs and zooming in on the central portion of the image, the display looks like Figure 6. To correlate features between two images, change the cursor to crosshair and lock the crosshairs into the same coordinate system. The "Load Analysis Commands..." function allows the user to define menu items which call scripts. The displayed file (and optionally regions) are exported to the script which is executed, returning the results to a ds9 text window. This process requires two things: an analysis file which defines the menu item and the script which is called by the menu item. A shell script named "script.sh" is used for this example, but any type of script is possible. #Define a menu item to call "script.sh"
The script output is sent to $text, which will appear in a new ds9 window. More information on the analysis file variables is given in the Analysis section of the ds9 manual. This analysis file can also be loaded automatically when ds9 is launched. To do so, either supply the pathname in the preferences or rename the file .ds9.ans and keep it in your home directory. There is a suite of scripts, called dax, that allows users to run some common CIAO tasks from within ds9. The tasks in dax are implemented in the same manner as Analysis Scripts, and are automatically loaded from the file $ASCDS_INSTALL/config/ciao.ds9 when ds9 is launched from within CIAO. The scripts are accesible from "Analysis → CIAO", as shown in Figure 7. Each category expands to show the available options. From the Detect menu, it's possible to run celldetect, vtpdetect, or get_src_region on an image. The ahelp file for dax has more information on the scripts, as well as some known limitations. X Public Access (XPA) is a messaging system which provides communication between Unix programs. XPA allows users to interact with ds9 and CIAO through a set of access points; access points are simply keywords that allow command-line interaction with the application. The two most common actions are retrieving information (xpaget) and issuing commands (xpaset). For more information, see the XPA Messaging System page and the XPA Access Points section of the ds9 manual. As a general rule, functions which are available in the ds9 GUI can be accessed through XPA. For comparison, consider getting the crosshair coordinates from ds9 and inputting them to dmcoords (e.g. to find the off-axis angle). Now that ds9 is running and linked to an XPA server, mark the desired point on the image with the crosshairs. Recall that the "Edit" menu is used to change the cursor. The point at (4101.375,4066.5) has an off-axis angle of 0.25 arcmin. The results are the same coordinates reported by dmcoords. Note that to get (RA,Dec) in degrees with dmcoords, it is necessary to set celfmt=deg and re-run the tool. XPA redirects ("%xpa()") also allow you to get information from ds9 and use it with the CIAO tools. This method differs from the previous example in that the values are automatically updated when the crosshairs are moved. Since ds9 and XPA can both be used independently of CIAO, it is possible that your system has a different version installed than the one that is packaged with CIAO. Also, in order to run CIAO scripts from ds9, the imager must have been launched from a term window already running CIAO. For these reasons, we recommend that you make sure CIAO is running in the current window before beginning any analysis task using ds9 or XPA. Otherwise, incompatibilities between the imager and the commands in the thread may arise. Any CIAO thread that refers to ds9 and/or XPA assumes that the version being used is the one packaged with CIAO. 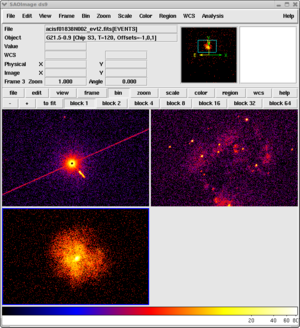 When a CIAO release is being prepared, the most recent version of ds9 available is used in testing and then packaged with the software. Since updates to ds9 are released on a much shorter timescale than CIAO, users may wish to upgrade independently of CIAO to take advantage of new features and bug fixes. If you wish to use a different version of ds9 than the one packaged with CIAO, please refer to this FAQ. It is not guaranteed that CIAO will work flawlessly with a newer release of ds9! 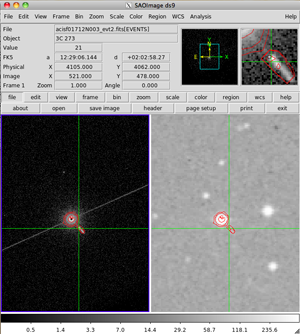 It is possible that changes to the imager may cause unexpected problems in the CIAO software. 03 Dec 2012 Review for CIAO 4.5; no changes. 25 Nov 2013 Review for CIAO 4.6. 04 Dec 2014 Review for CIAO 4.7. Updated for dmcoords change in CIAO 4.6 that now automatically accounts for SIM drift. asolfile parameter is now hidden. 01 Feb 2016 Updated ds9 links.